In partial modification of circular No. 608/E-10/Estt.-I/DHC dated 17.08.2017, it is hereby circulated for information of all concerned that O.M.F.No. 35034/3/2015-Estt. (D) dated 27/28.09.2016, issued by the Government of India, Ministry of Personnel, regarding upgradation of benchmark from “Good” to “Very Good” under the Modified Assured Career Progression Scheme (MACPS), is applicable w.e.f. 1st January, 2018. The required grading of “Very Good” will be applicable only in respect of ACRs from the current year, i.e. 2017 onwards. 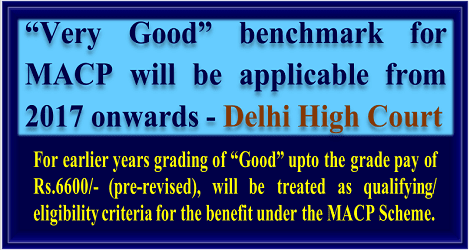 For earlier years grading of “Good” upto the grade pay of Rs.6600/- (pre-revised), will be treated as qualifying/ eligibility criteria for the benefit under the MACP Scheme. Sir, My MACP is due since 20.11.2017. My office has rejected my MACP due to benchmark Good. But as as per Dehli high court circular benchmark very good. Will be applicable wef 01.01.2018. What should I do now?